Christmas is approaching! I think that it's time to make some beautiful ornaments! Here are some suggestions! This pattern was designed by Lorna Watt and is available at her Ravelry page! Lately I've been toying with the idea of crocheting a scarf for myself. I've been looking for patterns but I've found so many and they are all so pretty that I don't know which one to make. These are some of my favorites and they are all free patterns!!! Owls are very present here where I live, we can see them in the telephone poles and wires when the sun starts to set and we can hear them through the night! Recently they have been very active and we can hear them vocalizing a lot and on several occasions it seams to be more than one! 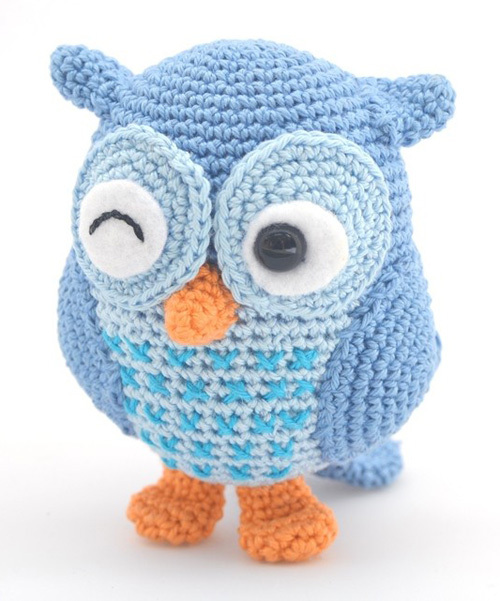 Jip the Owl by Tessa van Riet-Ernst from Woolytoons (free pattern). Yarnbombing is a street art that uses knitted or crocheted yarn to give color and fun to our gray cities. The following are some of my favorite! Here are some of my favorite projects made with t-shirt yarn. This colorful rug was made by Meg McElwee at Sew Liberated. The tutorials for these cute cup bases are available at Yumicha. These were made in knitting but they can easily be made in crochet too! The pattern for this cute little bag is available at Hooked Zpagetti. The tutorial for these bright flowers by Carmen Heffernan is available at Mollie Makes. The video tutorials to make this beautiful garland is available at Craft Craft and on CRKdesigninfo's Youtube channel. Both Crochet Flowers Motifs (Crochet Garden Series and Orange Lime Red Aqua) were designed by Annie Design and are available at her Etsy store. Go get ready! We are going to the beach with these summer loving amigurumi! My mother is finishing her current blanket and asked me to look around for more cool designs. The pattern for this fairy house is available for free on Ravelry. Visit Isabelle's blog for more super cute projects! The pattern for this cute mushroom house is available for free on Ravelry. The ceiling opens up to reveal the recipes! This cute amigurumi is available at Amanda's Etsy store. Amigurumi have mothers too! These are some of my favorite amigurumi moms with their babies! The pattern for Daphne and Delilah is available at dangercrafts' Etsy store. The pattern for Kira is available at lalylala's Etsy store. The pattern for the Tortoise Mom, Baby and Birdy is available at TheTrendyYarnStudio's Etsy store. The pattern for Mum and Baby Ducks is available at Denizmum's Etsy store. And don't forget, Mother's Day is coming up! You can find more amigurumi by Hello Pebbles on DeviantART. The Rainbow Tree pattern is available on Ravelry. You can see more of Erin's amigurumi at her Etsy shop. The seahorse pattern is availabe for free, in German, at Pfiffigste. Gecko's pattern is available for free at Ravelry. Available in German and English. Roary the Tiger's pattern is available at Amigurumi Patterns. Today being International Women's Day I thought a good way to mark it was to share these beautiful amigurumi ladies and girls! The pattern for Suzette is available here! This super cute pony is the work of LeFay00 at Deviantart. Check out her Deviantart page for more cute projects! How to Insert a Zipper and Lining into a Crochet Purse by Carrie WolfNeed to apply a zipper and lining on your crochet bag and don't know how? Check out Carrie Wolf's tutorial, it's detailed and full of pictures and easy to follow. I really love this guy! Seems like at any moment he is going to turn his head and begin a conversation with me! =) I really want him in my couch! The couch monster is a creation of debivanzyl on Etsy. What a lovely family picture! Garfield, Pooky and Odie hanging out in the garden on a lovely afternoon! Check out aphid777's Deviantart page to get Pooky's pattern! Do you have a beloved crochet piece made out of granny squares that is coming apart? Check out Trudi's tutorial on her blog Creative Fidget! I know that Christmas season has passed, but I say it's never too late for super cute little Elfs! Kimberly at Seriously Daisys made this cutie by altering the Ernie and Erline Elf design by Deb Richey at Crafty Deb. She even wrote down the changes she made on her Ravelry account! The Knitting Octopus is available at Max's World and at Max's World Ravelry page. Check out the tutorial for this easy and fun way to use two colours in your amigurumi at Needle Noodles! The tutorial for these lovely granny squares is available at Repeat Crafter Me. The pattern for this fun hat is available at Repeat Crafter Me.